If a 5.5-litre V8 SL with 556bhp sounds a little too dull, then don’t fret. 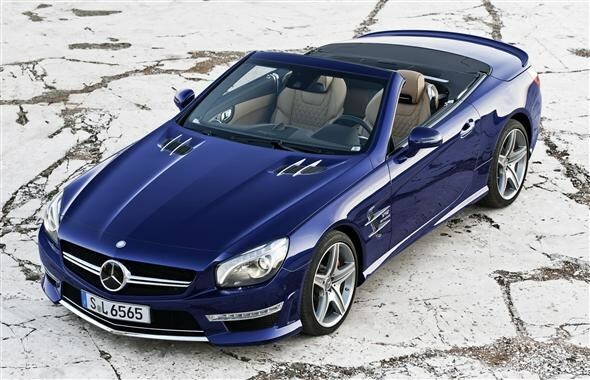 Mercedes-Benz has released details of the more powerful SL 65 AMG roadster, with a 6.0-litre V12 producing 630bhp. The car, which follows on from the SL 63 AMG and the standard SL model, has benefitted from some serious weight reduction. A substantial 170kg has been cut from the car, helping to improve performance and efficiency. As well as the rather excessive 630bhp, the V12 produces a rather impressive 1,000Nm of pulling power. These two figures combined means the car is capable of going from zero to 62mph in just four seconds. That might sound impressive, but it's only 0.3 of a second quicker than the SL 63 AMG model. If you’re looking at buying a car like this then running costs won’t be high on the priority list, but they have been improved compared to its predecessor. Aided by the addition of a seven-speed automatic gearbox and stop/start, fuel economy has risen to a claimed 24.4mpg, up from 20mpg. Emissions have dropped from 333g/km down to 270g/km, though this does mean you’ll still pay £1,000 in first year tax and £460 per year thereafter. This latest version gets the new ‘brand face’, according to Mercedes. The main focus of this is the twin-blade radiator grille along with LED light surrounds, chrome bonnet fins and side of the wings. It also comes with AMG sports suspension, speed-sensitive steering, a three-stage stability control system and a limited slip-diff. The new Mercedes-Benz SL 65 AMG will get its full premiere at the New York Motor Show in April, and will begin to arrive in the UK in autumn. Prices and specifications are expected to be announced closer to the on sale date, though you can expect it to start at around the £150,000 mark.